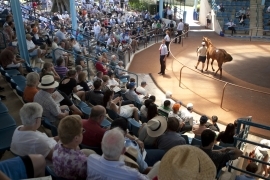 It was a hot start in and out of the sale ring on the opening day of the 2015 Inglis Classic Yearling Sale Summer Book on Sunday 8 February as the average and median roared up 30% to new benchmarks. “The new February timeslot has also proven popular with vendors and buyers. I am delighted for the average and median to be up by more than 30% on last year, but even happier to achieve a clearance rate through the ring of 84%, we know this will only improve further as the sale continues,” Webster adds. CLICK HERE to view Inglis TV's wrap. 136 yearlings were sold today at an excellent clearance rate of 84% and average of $45,169, which is a 33% increase on 2014’s figure. The median is up 36% to $38,000 underlining the unmistakeable increased strength in the market at Classic. The highest Classic Sale price since 2007 was set today when Lot 31, a colt by Per Incanto from Da Vinci Code, was sold by Sledmere Stud as agent for Little Avondale Stud to James Harron Bloodstock and Snowden Racing. First season sire Smart Missile had four yearlings sell on Day One for an average of $106,875 including Lot 41, a colt from Dashie Diva, for $200,000 to Mark and Shelley Treweek’s Lyndhurst Farm NZ. Other First Season Sires to have progeny sell for $60,000 or more includes Zoffany, Jimmy Choux, Pluck, Dream Ahead and Shrapnel. Lot 41 was one of two lots sold by Bell River Thoroughbreds with their other offering, a colt by Not A Single Doubt from Extremely, making $100,000 to the bid of Luke Wilkinson of Mick Price Racing when offered as Lot 86. Nine lots made $100,000 or more on Day One of the 2015 Inglis Classic Summer Book to buyers from New South Wales, South Australia, Victoria, New Zealand and Hong Kong. “We are pleased to see the return of syndicators and trainers who have already enjoyed success with Inglis Classic graduates, along with many new buyers from Hong Kong, China, New Zealand, New South Wales and interstate,” Mark Webster added. Inglis’ Make-An-Offer Service is available for lots which passed-in on Day One at the Inglis Classic Sale. Day Two of the auction starts at the earlier time of 10:00am tomorrow with Lots 175 to 390 to be offered. Tuesday’s session will also begin at 10:00am with Lots 391 to 574 for sale. The remaining two days of the 2015 Inglis Classic Summer Book will be broadcast on Inglis Sale Day Live, plus Online Bidding and Make-An-Offer will again be available.